I need help identifying this bear. 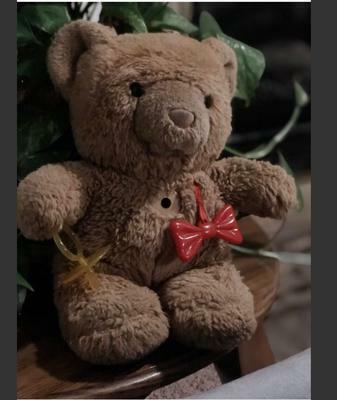 My grandmother purchased this bear over 30 years ago and I would like to get her a duplicate if I can find one. Bear is roughly 12” head to toe. This bear was purchased in the 80’s by my grandmother in Salt Lake City Utah. Unfortunately she doesn’t remember what year she purchased it. This bear talks and has a voice box that can come out from a hole in his back. Tag is too worn but the voice box says it’s from ”uneeda” doll company. I have searched uneeda doll company teddy bears and have found no similar bears to this. Bear has a motion sensor hole is his belly. Bear says the following words “mama” “papa” “rawr” “achoo”. As far as I know the red plastic Bowie and pacifier were attached to the bear upon its purchase. If you can help. Thank you!